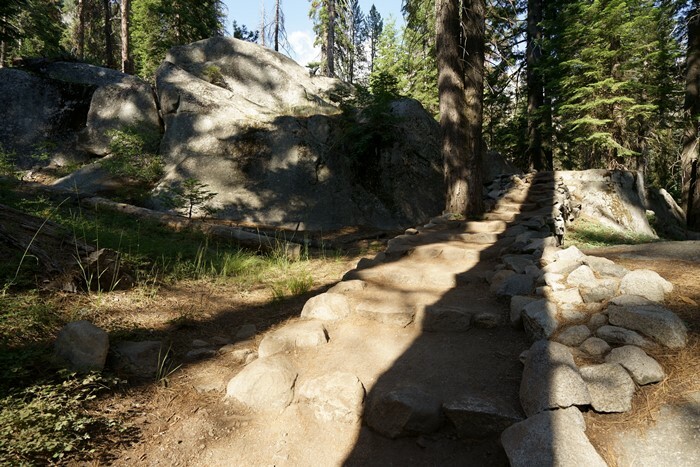 One of the best hikes of my visit to Sequoia National Park was on a trail that I didn’t even know existed. 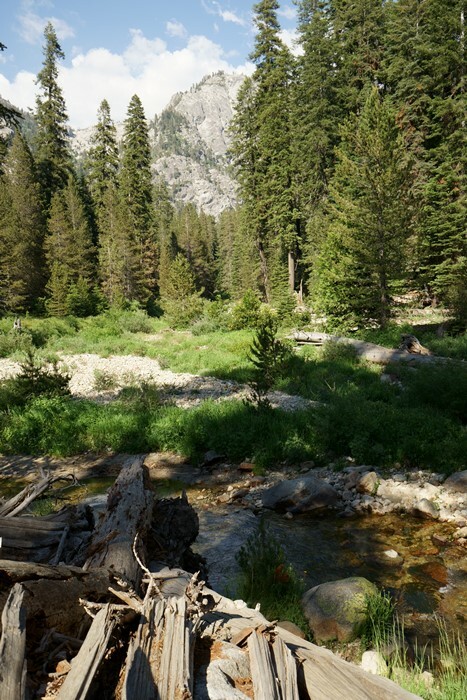 The Tokopah Falls hike seems to be well-known by people staying in the nearby campground at Lodgepole, but I hadn’t heard about it until I saw it on the map, as I wrapped up my afternoon in the park. 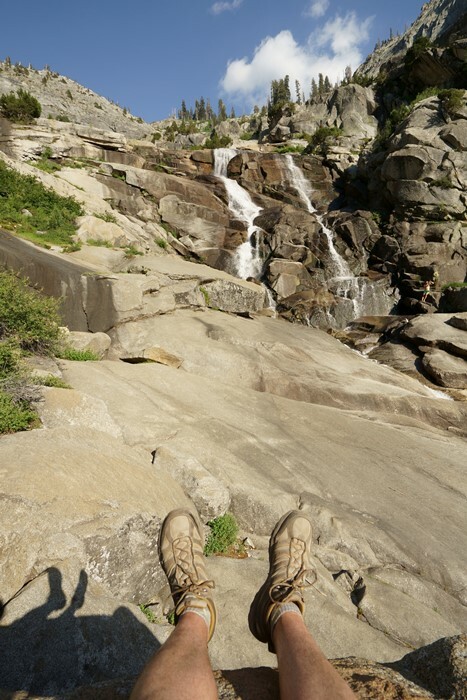 The trail to Tokopah Falls takes you from the forest to the end of a canyon, with wide-open views, rocky cliffs, and a spectacular waterfall. And as a bonus, it’s a fairly easy trail, with just a 630-foot elevation gain spread out over two miles (one way to the falls). The Trailhead for Tokopah Falls is located behind the Lodgepole village store and visitor center. From the Generals Highway, turn at Lodgepole and drive past the store. You’ll pass through a guard station for the Lodgepole campground — tell them you’re parking to hike the Tokopah Falls trail, and they’ll let you through. Park in the large parking area, as close to the shuttle stop as possible. Hike up the road, past the bus stop, then walk across the bridge to the campground. 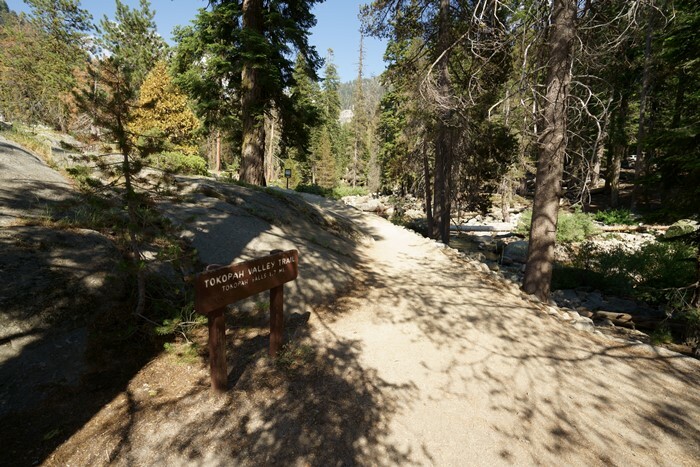 Once you’ve crossed the bridge, the Tokopah Falls trailhead is on the right. I had parked at the shuttle stop at Lodgepole to visit the Sherman Tree and Congress Trail. Once I was done with that, I needed one more trail to round out my day. Since my vacation was coming to an end, it would essentially be the last fun part of my trip. I had seen the Tokopah Falls hike on park maps, and I knew the trailhead was nearby, but I didn’t know anything about the trail. So, I stopped in at the Lodgepole visitor center and asked for suggestions on where I should hike on my way out of the south end of the park. The ranger recommended the Tokopah Falls hike, saying it was fairly easy and very scenic — and short enough that I could get it done by the end of the day. As the trail begins near the upper Lodgepole campground, the views are not spectacular. 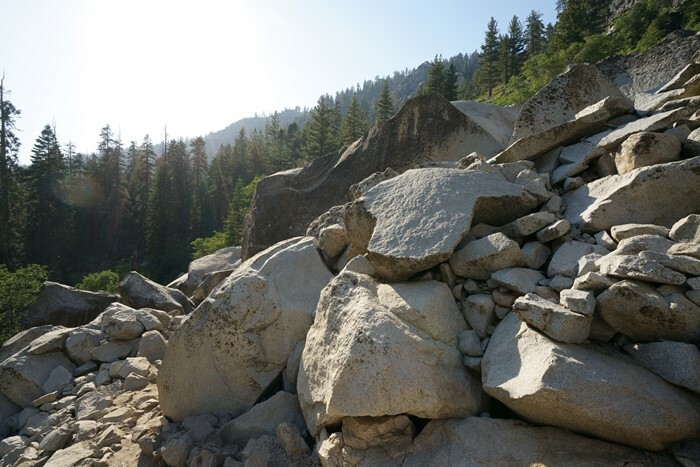 You’ll be hiking alongside the Marble Fork Kaweah River, and for the first bit, there will be some campgrounds along the river near the trail. Soon you’re free of that crowded area and the views start to appear. Cliffs peek out between the trees — mountains which will later be completely visible. Trudge through this part of the hike with the confidence that the views improve up ahead. It was already almost 5 o’clock when I started on this trail, so there were some big shadows being cast by the trees. That said, there aren’t a lot of really giant Sequoia trees along this trail. It’s just a nice, peaceful forest. I’ve seen the hike listed as 4.2 miles on some websites, and 3.7 miles on others. I think it’s safe to assume that you’ll be hiking roughly two miles, one way, to reach Tokopah Falls — plus some optional scrambling on the rocks at the end. … and Tokopah Falls comes into view, along with the entire upper end of the valley. This is the only challenging portion of the trail. The hike through the boulders is rougher than the rest of the path, but it’s moderate at best. 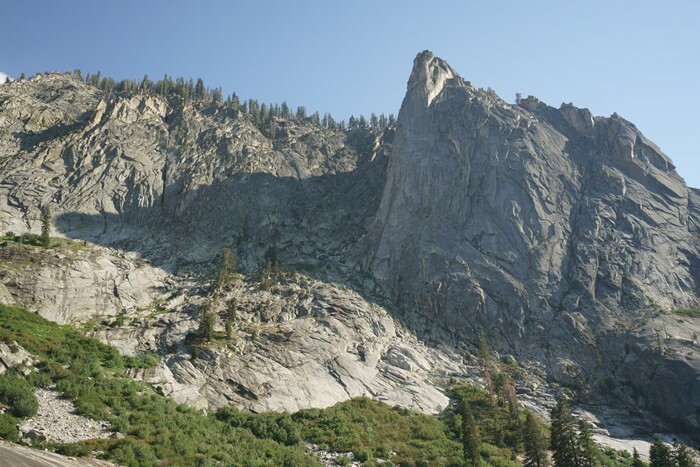 On the south side of the trail, across the Tokopah Valley, you’ll have a great view of The Watchtower, or Peak 8973. Yes, you can hike to the top of it, as part of a longer hike that begins at Wolverton (a separate trailhead not very far from Lodgepole). On the Tokopah Falls hike, in the late afternoon, the Watchtower acts somewhat like a sundial, casting a big shadow on the nearby cliffs. … until you find one like this. Just below this point, there’s a swimming hole along the Kaweah River. It was crowded with people — some of them diving into the water. That seemed a bit unsafe to me, considering that the nearest ambulance is, at best, a two-mile hike away. There were also three guys hopping around on the waterfall, trying to get the best Instagram picture. I took a seat and watched the waterfall and the crowd for a while, soaking in the final moments of my final hike of the trip. Then, I hiked back, for the final part of the journey of the day – the drive out of the park. 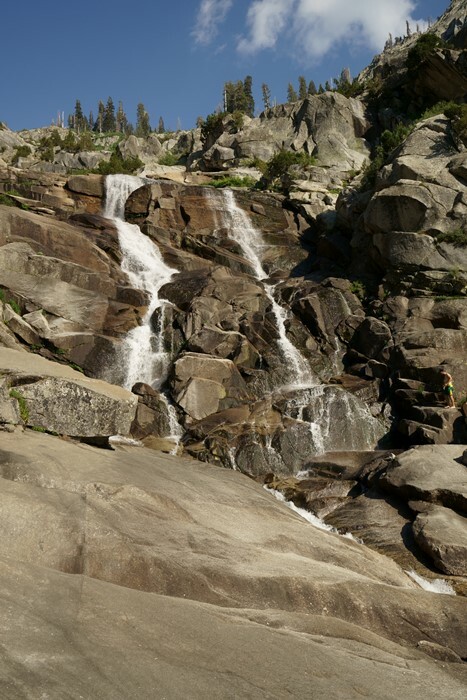 Whether or not you’ve brought your swimming trunks, the Tokopah Falls hike is a great way to spend two or three hours in Sequoia National Park. 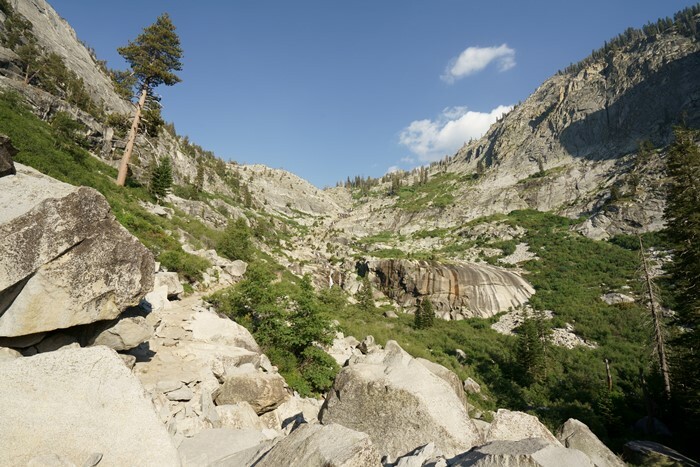 The fairly easy trail climbs gradually to a stellar view of the end of Tokopah Valley. Be aware, though, that solitude is hard to find on this trail, and you’ll probably encounter a lot of other hikers and swimmers.